Looking for a deal on boots? JCPenney has boots on sale for $19.99 plus you can use coupon code HURRY8 to get $10 off $25 purchase. If you add two to your cart, this makes them $14.99 each. 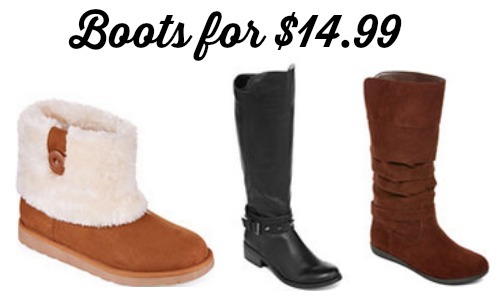 If you only need one pair, use code NOWBUY9 to get 20% off making the boots $15.99. Choose from tons of styles! Offer valid through 12/10. FREE in-store shipping for purchases $25 or more.